Our flight is scheduled to depart at 1:56 PM. I call Mom at 8:30 AM. She is up and dressed, but there are some things she can’t find. I go through the hedge Explanatory [Note: I live next door to my Mom] and find what needs finding, forget about the other items that won’t be needed on the trip. We empty the fridge of everything which won’t last two weeks. I take milk, meat, cheese, fruit through the hedge to our fridge for my husband’s survival rations. We bring the car around at 10:45. The door is closed and locked. We ring the bell. No response. We ring the bell again. Finally Mom opens the door. She had fallen asleep. Well, at least she is relaxed. We load two incredibly heavy suitcases, a jam-packed rolling tote, and an equally crammed Land’s End Tote into the trunk of the car. I hand Mom’s passport around her neck in a little ID pouch recycled from a trade show. I have my passport, cash, airline itinerary in a passport wallet around my neck. We are off! 1PM – At the airport: I have a Gold card for United thanks to my business excursions in Asia last year, so we get fast processing through check in; my mother’s silver hair gets us waved into the Priority line at Security, and we are quickly admitted to the Red Carpet Club, where we are informed of an hour’s delay of our flight. We have a four hour window at Frankfurt, now cut to three. No worries. We settle in with trail mix, raw carrots, cheese and crackers; Mom snoozes and reads; I read and write. Two hours later: Our plane is undergoing “aircraft servicing” and the flight time has slipped from 1:55 PM to 3PM to 4PM. We still have a two hour window to make our St Petersburg flight, but if it slips another hour we may not make our connection. I talk with assorted other folks using Frankfurt as a connection point to Moscow, Florence, Copenhagen, and other exotic points – many with tighter connections and fewer options. I’m glad we added a few days in front of our cruise date in St. Petersburg; I’m getting a little worried about the Saturday matinee ballet tickets my friend Maxas secured for us. I get online and email my husband and Maxas, more to vent than to inform, at this point. 3:30 – Boarding announcement. We gather our scattered resources and head for Gate 95. 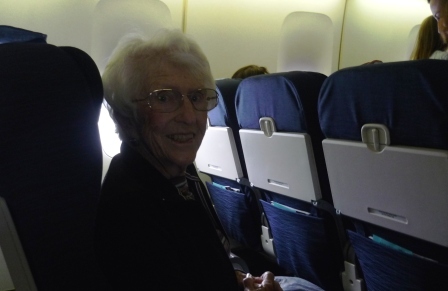 Again, Mom’s silver hair is even more effective than my gold card in getting us priority seating. 4:55: finally, three hours late, in flight. Our Frankfurt transfer window is cut to one hour. Will we and our luggage make it? On board and ready to fly!